Tyler Wright in action in Newcastle. SHE'S won two world titles but there is another special feat Tyler Wright might be able to tick off her to-do list at Newcastle on Sunday. Wright and brother Mikey have the chance to become the first brother and sister to win the major titles at the annual Surfest event after both surfed their way into the quarter-finals of the competition. Wright said she has never won a major event with any of her four siblings previously. "Owen, myself and my older sister Kirby were all in a final at a pro junior but I haven't had that experience at this level of event," Wright said. "It's sick to see Mikey into the quarter-finals and cool to be there with him. "It really shows all of the hard work he has put in to get to this level and it is cool as a sister to see him succeed. "He always looks out for me and pushes me so I feel like it will be good for each of us going into the final day. "I'm slowly building up and getting into the swing of things and I'm excited for a big final day here in Newcastle." Older brother Owen was also supposed to have contested Surfest but cut his cheek in a surfing accident on the Gold Coast last week. Last Sunday Tyler and Mikey Wright were part of the Culburra team which won the Australian boardriders title. Mikey Wright is one of four Australians to make the men's quarters with Davey Cathels, Ethan Ewing and Stu Kennedy also advancing to finals day. 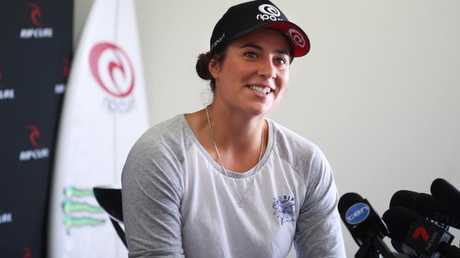 Tyler Wright will take on Northern Beaches teenager Holly Wawn in her quarter-final on a Sunday but missing from the final day action will be Sally Fitzgibbons, who was knocked out of the comp on Saturday.